(Release Date: September 2, 2014)  A prequel to 2003's "Cabin Fever"the oddball, gore-strewn '70s throwback that put filmmaker Eli Roth on the mapand 2010's troubled "Cabin Fever 2: Spring Fever," "Cabin Fever: Patient Zero" endeavors to chart the initial outbreak of the series' deadly flesh-devouring virus. Once located, the asymptomatic carrier, Porter (Sean Astin), is transported to an island laboratory in the Dominican Republic and put under strict quarantine by the manipulative Dr. Edwards (Currie Graham). Well, not too strict, as things hastily spiral out of control and the virus threatens the lives of everyone inside the building. Picking the wrong week to venture off on a secluded tropical bachelor party expedition, groom-to-be Marcus (Mitch Ryan) arrives on the thought-deserted island as all hell is breaking loose. A snorkeling trip in contaminated waters puts he and his friendsbest buddy/business partner Dobbs (Ryan Donowho), brother Josh (Brando Eaton), and Josh's girlfriend Penny (Jillian Murray)in calamitous danger before their search for help leads them directly into the hot-zone lab. Directed by Kaare Andrews (helmer of the "V is for Vagitus" segment in 2012's "The ABCs of Death"), "Cabin Fever: Patient Zero" moves back and forth between its two main plot threadsthe distraught Porter's plot to escape captivity and Marcus' bachelor festivities gone awryas they edge ever closer to a fateful collision. Sean Astin (2007's "The Final Season") gives his all to the patient zero of the title, a family man whose son has already fallen victim to the virus, while the unraveling exploits of Marcus and his contentious pals keeps one's attention via its disgustingly extravagant make-up effects. None of these obnoxious yuppies are particularly likable, and the viewer's sympathy for them only deteriorates as they continue to spar over their petty interpersonal problems even as they vomit blood and their skin starts to fall off in chunks. The screenplay by Jake Wade Wall (2006's "When a Stranger Calls") is craftily constructedthe reverse-order montage during the end credits is very cool, indeedbut in writing a story about a world on the verge of a global pandemic, he has only conceived of a single charactercompassionate scientist Camila (Solly Duran)who is at all worthy of caring about. "Cabin Fever: Patient Zero" lacks the personality and humor of Eli Roth's debut feature, but it delivers in droves on the grisly brand of payoffs for which his original film is known. "Cabin Fever: Patient Zero" was shot with the Red Epic camera, and its aesthetic dignity suffers from a host of issues likely spurring from its digital source. Any time there is a moving aerial shot of the ocean or the forests, the image becomes awash in unsightly moiré, aliasing and even judder. In a few of the darker scenes, banding also pops up to rear its ugly head. There is something noticeably synthetic about the visual look, though some of this may be connected to color timing that often runs overly hot. Not everything is doom and gloom, however. The Blu-ray's clean 1080p transfer is unmistakably of high-definition quality, ripe with frame detail and largely impressive black levels. This is absolutely a step above its standard-def DVD counterpart and digital download version, and is the best presentation of the film. The 5.1 DTS-HD Master Audio is effectively showcased, a valiant sonic mix that pulls off some excellent surround action betwixt the evenly leveled dialogue. 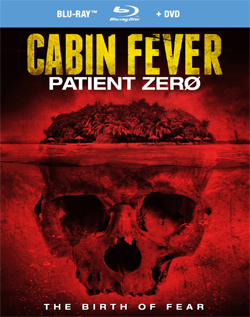 Released by RLJ Entertainment and Image Entertainment, "Cabin Fever: Patient Zero" infects Blu-ray with an immersive audio track, a picture that proves problematic but superior to all other home entertainment formats, and a dearth of bonus content. For fans of the "Cabin Fever" franchise or icky, no-holds-barred horror in general, give it a shot with a rental or, for collectors, when there's a solid discount on the title.